How Buddhist communities can help their aging members. Introduction by Lewis Richmond. Nowadays one can’t help noticing the sea of gray hairs at dharma programs and centers. The baby boomers who came of age in the 1960s and 1970s, and who often began practicing the dharma then, are growing old—not that they readily acknowl­edge it. Meditators long accustomed to sitting cross-legged are now sitting in chairs; youth­ful dreams of enlightenment have been sup­planted by more immediate concerns about health, loss of vitality, finances, and adult children in crisis. More recently I visited a very large Bud­dhist temple that serves a Japanese-American community. The congregation was about to celebrate its one-hundredth anniversary. The minister showed us a full-sized gymnasium where the temple runs a busy schedule of after-school sports and martial arts, plus several other buildings that host classes and gatherings for seniors, children, and parents and serve as a meeting place for community-outreach and social-service groups. 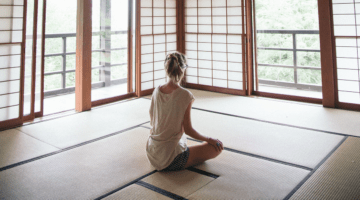 Unlike the Japanese-American temple that functions as a full-service community church, meditation Buddhism and its centers and sanghas seem to have been founded on a narrower and more purely educational mis­sion. Yet now that so many practitioners are entering the last decades of their lives, these American dharma centers are facing an unan­ticipated challenge: the growing needs of an aging sangha. How will dharma practitioners and the centers and sanghas in which they prac­tice meet this challenge? Can we creatively develop practical strategies and adjustments to keep pace with an aging population? Or will we continue to muddle along, doing what we’ve always done, until our practitio­ners grow too old and sick to show up, and our once thriving centers diminish and slowly fade away? The question is clear, the answers less so. My bet is that we will find a way. But the devil is in the details. Practically speaking, what is our vision and our plan? That is the topic for this issue’s Forum. Buddhadharma: The idea for this discussion came in part from a few emails I got within days of each other from people who described themselves as older Buddhists. They were saying, somewhat desperately, that we really needed to be talking about the challenges facing the growing number of aging practitioners. The three of you were invited to partici­pate in this forum because your communities are doing more than most to address the needs of older practitioners. How did each of you first become involved in this? Susan O’Connell: I’ve lived in the San Francisco Zen Center community for seventeen years, and I got interested in the situation for seniors here almost the minute I arrived, when I noticed we hadn’t planned for the extra rooms we would need to house the older teachers when they left their staff positions and became eligible for our Elder Monk program. Buddhadharma: What is the Elder Monk program? Susan O’Connell: We made a promise to people who devoted their life to being part of the residential staff at Zen Center for twenty years or more that when they turned seventy they could apply for what we call our Elder Monk program, which basically guarantees room and board for life. So I’ve been the main driver of this issue in the organization, envisioning some of the ideas we’re working with for both our residential community and the wider community that SFZC serves. And I’m sixty-six, so this is personal. Anna Douglas: I’ve been a teacher at Spirit Rock since its founding. I’m seventy-three, and through my own experience of aging I realized that not much was being done at Spirit Rock to address the needs of this new generation of older people who are going to live longer and healthier lives. That’s why I got involved in teaching classes and daylong programs aimed at older practitioners—such as Compassion as We Age, The Three Wisdom Doors of Aging, and Awakening in an Aging Body. This May, I’ll be co-leading the first retreat at Spirit Rock for people fifty-five and over called Aging as a Spiritual Opportunity. David Whitehorn: Well, I’m seventy-one, so I guess that makes me the middle child here. I got into this issue about five years ago because the leadership of Shambhala recognized that we didn’t have any systematic plan for the fact that a very significant proportion of our community is growing old. We then formed the Shambhala Working Group on Aging, and I was the first to chair that committee. You know when I first got involved in setting up the work­ing group, quite a few people came to me and said, “Why in the world would you want to remind us that we’re getting old?” So what we took from that was that people needed to have opportunities and encouragement to essentially awaken to where they actually were in life. It’s almost like what we used to call “consciousness raising” in the Sixties. Only now we’re saying, guess what, you’re aging, and you know what? If you think about your practice fundamentally, there’s abso­lutely nothing wrong with getting old. Anna Douglas: It’s not a medical emergency. David Whitehorn: It’s not at all! Susan O’Connell: It takes a lot of intention to turn toward the reality of our own aging, no matter who we are. It’s very scary. We’ve been trying to get our elders to fill out these forms to let us know what their plans are, and they don’t want to do it. They don’t want to turn toward it. People should know that it’s just as hard for a senior practitioner to deal with change as it is for anyone else. David Whitehorn: And yet despite being immersed in a culture that’s telling us to turn away from aging, there is a tremendous opportunity for older practitioners to actually get to a deeper level of practice as they experience this stage of their life. Just getting people to stop and think about that is important. Susan O’Connell: Right, remember what Ram Dass said after he had his stroke? He was lying on the gurney, being wheeled into the emergency room, and realized that his practice had gone out the window. Suzuki Roshi, too, after he almost drowned at Tassajara, gave a talk that basically said, Now I really need to start practicing. So this is not easy. Even very, very strong practitioners like Suzuki Roshi and Ram Dass saw the part that they weren’t committed to. We have to be warriors to face this. Anna Douglas: The teachings of anicca, anatta, and dukkha are wisdom doors to a deeper practice, to really looking at the reality of aging and change and the suffering of trying to hold on to the past. Growing old is a place where the universal and the personal meet. People’s experiences of these truths become very vivid as they age, and they have the opportunity to, as you said, practice like warriors. Anna Douglas: What have we been doing?! Susan O’Connell: So it’s really important to figure out how to do this. And I think there is quite a bit of interest in it. 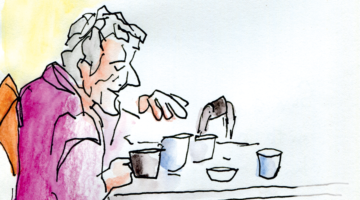 Anna Douglas: One of the biggest things I believe we can offer is a place to have meaningful conversations about the aging process, which is not always available in the mainstream cul­ture. The sense of confusion and vulnerability, of loss, that people face is very real, and one way to address that is to sit silently on your meditation cushion. But it also helps to have a community in which to share your experiences and talk about the teachings of anicca, anatta, and dukkha. If you’ve had a healthy body all your life and that begins to disappear as you age, it is very challenging. You know, who am I, really, if I’m not this body? Then the teachings on emptiness of self become much more apparent, and so does the true meaning of liberation. Buddhadharma: David, how do you see the challenges facing older Buddhists in the Shambhala community? David Whitehorn: Fundamentally, these are all practitioners who have devoted their life to figuring out how they see them­selves and how they want to work with the world. They’re asking themselves, How do I apply my practice to what I’m experiencing now? It’s obvious that practice is exactly what you need to deal with all the change and uncertainty that Anna mentioned, but also, as she said, people are looking for ways to get together and talk about this. One of the things the Working Group did early on was identify the need for something one might call rites of passage for older people. Susan O’Connell: That’s a great idea. David Whitehorn: In the Shambhala community we’ve long had rites of passage for eight-year-olds and sixteen-year-olds, and everyone has really appreciated those. So last year, Sakyong Mipham Rinpoche, the head of Shambhala, created a rite of passage for adults called Awakening to the Stages of Life, and we did a pilot program last fall. It’s a weekend program intended for people who are at any of the major transition points in life, not just those connected to old age. The idea is that aging is a continuous process throughout life. It’s helpful to have practices and gatherings where we can get together and immerse ourselves in the contemplative cul­ture while actually working on the practicalities and realities of the aging experience, and I think that’s what many people are looking for. Buddhadharma: Let’s talk more about some of the ways centers such as yours can help with the needs of older practitioners. Aside from the programs that you might put on, what about meeting people’s needs where they are, in their homes or com­munities? Traditionally, many people looked to their church to support them in their final years. Members of the parish could be relied upon to visit the elderly and bring them food, and churches even set up nursing homes. Are your centers looking to fill those functions? Susan O’Connell: We haven’t done anything like that yet at the San Francisco Zen Center, but the Berkeley Zen Center did organize a loose group of people to be available if someone asks for help. Many of their members are retired, so they can respond to requests. In a perfect world, a volunteer corps would grow from the caregiving training we’re now doing at Zen Center, but it will happen either in a village model, in which people go to other people’s homes to provide care, or in a senior living community, where that kind of care will be much closer at hand. Anna Douglas: In November we’re beginning a two-year con­templative training program called Heavenly Messengers. A significant component of the program, which Spirit Rock is partnering on with the Metta Institute and Frank Ostaseski, will be a weekly commitment to serving people who are ill or elderly or dying. David Whitehorn: Shambhala has actually been involved in this kind of thing for a long time. Early on, when Chögyam Trungpa Rinpoche first started gathering students, he told them to organize into neighborhoods. It was certainly for social reasons, but it was also so everybody could keep track of how everybody else was doing, and if people needed help, they could get it. So we’ve had a lot of experience with the spontaneous circles of care that form among friends and neighbors when someone is ill.
There’s some interesting literature about how you create circles of care, which doesn’t actually come from the Buddhist perspective, but adding this contemplative perspective is really helpful. Personally, this is what I see happening with Shambhala at this point. We have some people who have spe­cial training in contemplative care, and they’re encouraging others, but mostly people spontaneously come forward when there’s a need. It’ll be interesting to see what happens over the next few years because there’s going to be more and more need. I feel we’re sort of at the beginning of the wave. It hasn’t really broken yet, and probably more structure will be neces­sary as more people need help. Anna Douglas: I was thinking also that this conversation we’re having right now is a new conversation, and although we have some history behind us, like David was saying, we’re really embarking on a new venture in the dharma world, which is this venture of how do we grow old together? How do we serve each other? How do we awaken through this experi­ence? These are new questions for our Western dharma com­munities, so hopefully if you asked us these questions in five or ten years, we would have a lot more to tell you. Susan O’Connell: Some members of the Zen Center have lived in this community for forty-five years, so it is critical to con­tinue to offer that to people as they age, even if not everyone will be interested in living in that way, with that kind of sup­port. What I’ve been trying to do is combine the Zen Center’s need for more housing for its elders with providing a place for others to experience the benefits of community, one where people can live and practice and learn from one another. When I first met with the group that we’re partnering with to operate such a place, Northern California Presbyterian Homes, they had just completed a survey to better understand what the next paradigm would be for senior living, and they came up with two words: community and spirituality. It’s interesting that the next thing isn’t going to be senior liv­ing on a golf course or at a shopping center. It will be based on community and spirituality, and that’s what we’re trying to do. Buddhadharma: How far along are you in developing the senior living community and how many people will it accommodate? Susan O’Connell: We’re actively searching for property right now. When we did a survey, half the people wanted to live in a more bucolic setting, for instance somewhere out in Marin County, and half wanted to live in San Francisco and have more of an urban experience. We’ve been exploring both of these models. The first model would have about 240 units—studios, one-bedrooms, two-bedrooms, and larger units—including independent living, assisted living, and hospice facilities. The community will obviously have a meditation hall and provide teachings and the kind of contemplative care that is at the heart of the vision. The other potential model is something a little smaller, so maybe 100 units in a more urban setting. We’re still working on how that model would work in terms of care—whether there would be assisted care there or nearby. But we’ve done a lot of preliminary work, and we have the funding we need to go into development. Once we have the land, we could be up and running in four or five years. David Whitehorn: What you’re doing, which the Working Group on Aging began discussing years ago, is sort of the dream of everybody. Susan O’Connell: I think it’s the Zen Center’s responsibility to do it. David Whitehorn: I know you have very practical reasons to do it, but there is another model of aging I’ve been more inter­ested in lately, which is called “aging in place.” Basically, you don’t bring people together in a single place but you create a sense of community in some physical locale, and you bring services to people where they are already living. We have a lot of people who like this idea, because it seems more practical for the scattered communities we have in Shambhala. There’s a model that started in Boston, on Beacon Hill, where there were a lot of reasonably affluent people who were getting old and didn’t want to leave their homes. They wor­ried about being able to maintain themselves properly, so they banded together and formed a group-buying organization, which enabled them to contract with plumbers, electricians, and others to get lower rates and priority access to these ser­vices that somebody who is living in a house and is getting older might need. They call it the “village movement,” and it has sprouted up in a number of other places to help people get whatever services they need so they can age in place. Susan O’Connell: There’s something similar happening here called San Francisco Village, so I think different cities are experimenting with this. David Whitehorn: Another thing I wanted to mention is that Shambhala has been using online teaching and meetings for a number of years, I think with a lot of success. We realized, after the fact, that online programming addresses the issue of physical accessibility. A number of older practitioners were telling us they couldn’t go to the rural land centers for pro­grams anymore because it’s too physically demanding. Even getting to and from an urban center late at night can be difficult. So this technology can help keep people connected both in terms of receiving teachings and in feeling they’re part of the community. Anna Douglas: I must mention an online course started by the Barre Center for Buddhist Studies called Going Forth, which is a virtual community for people who are retired or nearing retirement age. Their focus is on daily practice and study of Pali texts as well as participation in an online forum. Anybody can join, and they’ve had a wonderful response. Buddhadharma: Anna, can you also say more about the Heavenly Messengers program that Spirit Rock is starting this year? Anna Douglas: It will be a two-year program for about ninety people. We’re taking applications now. The program will look at what the Buddha called the four heavenly messengers: old age, sickness, death, and the potential for liberation when we turn toward these realities, as has been said. There will be five weeklong retreats where people contemplate and practice with these teachings, as well as a service component that Frank Ostaseski will bring from his work at the Metta Institute, about how to be compassionate companions to people who are ill or dying. We hope people will come to this program from all over the country and be equipped to take these teach­ings back to their own dharma centers. Susan O’Connell: We’re doing something similar to Heavenly Messengers. Our program, the Contemplative Caregiver Course, has a slightly different format; it’s a one-year curricu­lum that started at the end of January with a career practicum in the middle and it’s informed by some of the same learning that came out of Zen Hospice training. We’re presenting a new curriculum, developed by Jennifer Block, around what we’re calling contemplative care. The heart of the vision we have for the Zen-inspired senior living community is this contemplative care practice, to be studied by the people who live there as well as the people who work there. It’s not like there are well people and sick people. The point is we’re all aging, so we all need to enter into this with our eyes wide open. Buddhadharma: What are some other things you would like to be doing down the road to support the elders in your community? Susan O’Connell: I would like to see us better organize our seniors, both residential and nonresidential, and have them mentor the younger people coming to the center. We live in a culture where one’s worth and one’s work are synonymous, so when elders are no longer the leaders in the community or don’t have a job that gives them a voice in decision-making, they’re lost. It’s really hard. We need to encourage mentoring as an actual position that makes a contribution. If we can fig­ure that out in our own community, we can help other people let go of their work and still feel useful in the wider world. Anna Douglas: Yes, there’s a unique opportunity in our culture for dharma centers to be intergenerational and to know older people as elders with value in the community, rather than as a burden. David Whitehorn: Shambhala is increasingly focused not only on people’s individual practice but also on the transformation of the culture and society we live in. So my sense of the next thing we need to do is to open our boundaries and take what we’ve learned from our practice and understanding of con­templative care out into the world. By sharing what we know and learning from other people, the boundaries between spiri­tual communities and the wider community dissolve. Working with the generation that’s aging now is opportune because I think boomers in general, even if they have never sat on a cushion and done any meditation, are much more open than previous generations to a contemplative view. And, of course, it will make more and more sense to them as old age, sickness, and death become more of a reality. The Zen Hospice activity of bringing contemplative care into the hospice movement is a really wonderful example of exactly this sort of thing. Buddhadharma: What advice do you have for other communities that aren’t as far along as yours in terms of considering and addressing the needs of older practitioners? Where can they begin? Susan O’Connell: I think all initiatives take a champion. Anna and I have made a commitment to looking for solutions, David has been actively engaged in holding this issue, and for each of us there’s also a personal interest in wanting to study this more deeply. So someone in every community has to be supported to come forward and advance the right response for that community. Anna Douglas: It does take a champion, but it could start out rather simply. If one person has an interest in forming a group for people fifty-five and over, they could invite them to sit together and create a safe space for deep inquiry into the expe­riences of aging. That’s something any dharma center could do. There is so much more to discover than the stereotypical experiences and bad jokes about aging. Wisdom naturally arises when people speak and listen deeply to each other and recognize the universal aspects of their experience. Buddhadharma: What advice do you have for elderly practi­tioners who are perhaps experiencing less than ideal circum­stances and will not have the benefit of a Zen-inspired senior living community or some of the wonderful programs you’ve talked about? How can they work with their situation? Susan O’Connell: I don’t know how anyone can do it without a community—even a community of just one other person. Find the right people—people who really want to witness and be witnessed and feel connected—because the isolation is real, particularly if you’ve lost a partner and friends and dogs and your housing. Our connection needs to be made physical, in at least one other person. As we age, and after practicing for however many decades, we come to realize that the reality of practice is quite different from the kind of idealism that got us through the gate in the first place. It is really so much about acceptance of what is—not wishing for the bells and whistles of some other life. Anna Douglas: Isolation breeds fear, and that is not helpful, so as Susan said, it’s good to have support from someone who can impart to you a certain degree of confidence in your ability to be present with compassion and bravery. David Whitehorn: I agree—the key thing is to connect with other people. But also, people I’ve talked to sometimes feel that practice is going to take care of everything. Yes, practice forms the foundation, but you have to actually do some very ordinary stuff: If you’re running out of money, go to a social worker and find out what you’re due from the government; if you’re sick, go to the doctor. Sometimes people who have been dedicated practitioners for a long time seem to feel practice is going to solve everything. Doing those ordinary things is part of reaching out. The isolation is interesting because it reinforces the sense that you are a separate entity, which, as we know from prac­tice, is not true. Using the fact you are connected to other people is not a sign of weakness but a sign of turning toward reality. I want to mention as well how wonderful it is to be old. From a practitioner’s point of view, I see it as the fruition of my whole practice. All my practice applies to what I’m deal­ing with right now. It’s a tremendous opportunity. For years and years, I’ve been trying to get below the intellectual level of understanding, and now, bit by bit, you get a little more chance to do so. I just think we need a balanced view of this stage of life. Anna Douglas: I agree, David, and I’m also quite interested in the mystery of consciousness in old age, because the sense of being does seem to expand, and the veils between the worlds do become thinner. The culture has become obsessed with the bad news about cognitive decline as people age, but what about the beautiful qualities of heart and mind that dharma practitioners have been cultivating: calm and equanimity, love and joy, and the sparkling clarity of presence? These don’t disappear with age, but actually deepen. Also, old age brings the possibility of truly letting go, moving us from a doing orientation to an alive and effortless being, another one of the fruits of practice. David Whitehorn: There is another mystery I’ve enjoyed puz­zling over, which is that there is some kind of deep sense of identity or self that does not age at all, that seems to be completely independent of the aging process. I find that quite interesting. And wonderful, actually. Susan O’Connell: I had a dream last night about walking by a young man who completely ignored me because I was old, and then turning toward him and whispering in his ear something like, “You don’t understand that the part of me that has not changed is completely alive, and I’m telling you this now so that when you are my age, you will remember and be able to tell someone else.” Those of us who have reached this stage in our life know that there is something completely alive about our experience that transcends growing old. Susan O’Connell is president of San Francisco Zen center and chair of its senior Living Facility Development Committee. She began practicing Zen in 1987 and was ordained as a Zen priest in 1999. She has lived at all three of SFZc’s centers. David Whitehorn is a longtime practitioner in the Shambhala community and former chair of the Shambhala Working Group on Aging. He is a retired psychiatric nurse living in Halifax, Nova Scotia, who helped develop a pioneering program for young people with psychosis. Anna Douglas is one of the founding teachers of Spirit Rock Meditation Center in Woodacre, California, and a member of its teachers council. She has been teaching in the Insight Meditation tradition for the past thirty years and is on the core faculty for Spirit Rock’s new Heavenly Messengers program. Lewis Richmond is a Zen priest in the lineage of Sunryu Suzuki Roshi and the author of Aging as a Spiritual Practice (Gotham 2012). he lives in mill Valley, California, where he leads the Vimala Sangha. 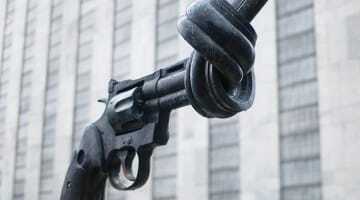 How should Buddhists respond to the gun violence epidemic?